Next to the projects that Globex Mining Enterprises Inc. (TSX: GMX – $0.34 & OTCQX: GLBXF – $0.26 & Fra: G1MN – €0.21) is advancing independently, it also has an impressive number ongoing joint-venture partnerships. The primary benefit of these JV arrangements is that the exploration programs are funded by other companies, while Globex typically receives a combination of annual cash and/or share payments; and a Gross Metal Royalty (GMR). Moreover, any discovery of new resources advances these JV projects further along the development curve, creating shareholder value for both the optionee and Globex. A case in point, this week JV-partner Renforth Resources reported an updated NI43-101 compliant resource estimate for the Parbec Property in Quebec. Globex vended this property to Renforth under an earn-in agreement to enable its partner to acquire 100% ownership of the property after the payment of $500,000 in cash plus 2 million shares of Renforth common stock, and the completion of exploration work amounting to at least $4 million. Renforth is now the operator of the project under these terms, and Globex shareholders remain leveraged to the ongoing successful advancement of Parbec through its minority ownership of its partner, plus a retained Gross Metal Royalty (GMR) of between 1-2% on a sliding scale depending on the price of gold. 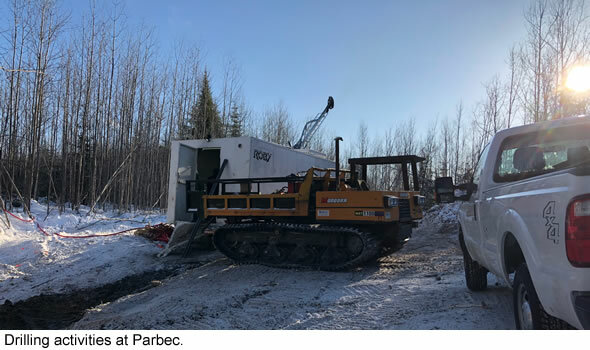 The Parbec property has been successfully advanced through several drill programs that have contributed to a larger total gold deposit, and achieved new discovery zones that have built the magnitude of total gold resources. New discovery zones and increased drill density for the deposit area contribute to a larger gold resource as this data is included in revised technical studies. With the update reported by Renforth, the resource for Parbec is now up to 656,875 ounces of gold in the inferred category, plus another 37,224 ounces of gold in the higher Indicated resource classification. The total increase in gold resources for the project amounted to 146,399 ounces of gold that has been documented since the previous resource estimate from March 2016. Parbec is located within the prolific Abitibi Greenstone Belt, on strike with the adjacent producing Canadian Malartic Mine operated by Agnico-Eagle Mines and Yamana. Similar gold-bearing host rock and structural features that contributed to the emplacement of one of the largest gold deposits in Canada at Canadian Malartic also extend through the Parbec property. In addition, due to its setting in one of the major gold producing areas of Quebec, the property area is well served by infrastructure and access to mining support services. This means that if Renforth advances Parbec through to development, the capital costs would be much lower as the company has the option to access nearby third-party milling or even the potential for a deal with an established mining company in the region. It should be noted that Renforth has demonstrated a track record of successful exploration at this property and completed 25 drill holes (over 5600m of total drilling) during the last 10 months. The expansion of the gold deposit is therefore a testament both to the competent and experienced team of geologists advancing the work programs, and the exceptional discovery potential of the property itself. The majority of the exploration work that comprises the data for the resource estimate was focused on relatively shallow drilling extending down to 440m below surface. Approximately 80% of the total resources presented have been outlined in shallow zones less than 200m below surface. However, gold zones have been encountered at depths greater than 700m and the deposit area remain open to further expansion both laterally and further to depth. Renforth is engaged in an equity offering to raise additional funds to continue with its exploration ambitions. The subsequent work programs that remain fully funded by Renforth will have the potential to build greater value for Globex shareholders if indeed the gold resources continue to increase. The combination of increased total gold leverage plus favorable economic circumstances related to the deposit at Parbec, improve the outlook that the project may ultimately be developed into a producing mine. Through its retained ownership of the GMR for the property, Globex would be the beneficiary of a stream of payments derived from any mining activity within the project area, and as the gold resource continues to grow the implied value of this royalty stream is also increased. The advancement of the Parbec property by Renforth Resources has created value for Globex shareholders. Based on the JV deal, Globex received a significant cash payment that was available to fund other growth initiatives on behalf of the Company. Globex was also granted a large block of shares of its partner Renforth that it may hold to retain leverage in the property, or sell at a time of its choosing for further cash proceeds. Renforth still has a number of cash and stock payments due to Globex. The GMR that was included in the deal will become more valuable as the gold endowment of the property is increased. This GMR is held in perpetuity and remains in effect even if the Parbec property is eventually sold. But with a positive outcome to exploration work and the decision to develop a producing gold mine, the GMR will become a valuable stream of royalty payments for all metals produced during the life of the mine. Globex is currently receiving recurring royalty payments from other mines that were vended to partners in similar circumstances to the deal with Renforth for Parbec. This significant revenue stream is contributing towards funding the acquisition of new projects in the pipeline and the advancement of currently held properties in the portfolio for the Company. The successful advancement of the Parbec property is a validation of the quality of the asset base that Globex has assembled and continues to build as part of its strategy to be a project generator. This has enabled shareholders to participate in the resource development of numerous high-quality properties, both held independently and through JV arrangements, even during a difficult market regime for the entire sector. The highly cyclical nature of the junior resources sector ensures that eventually more bullish conditions will return and Globex is well-positioned with fundamental strength of high-quality assets, a strong balance sheet, and a successful track record of achieving shareholder value. Recommendation: BUY.